She's Fantastic: The Evil Horde's ENTRAPTA! 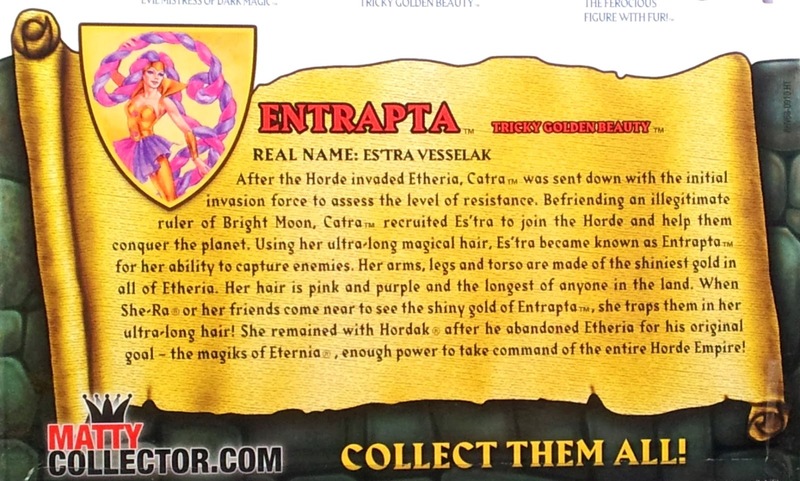 Entrapta was always one of my least favorite characters from She-Ra. I didn't like her design, I didn't like her powers, she inexplicably had Catra's voice, and most of all, I just hated her color palette. She stood out from the rest of the red, black, and blue Horde with her bright colors. In the cartoon she wore purple, blue, and gold with orange hair. The toy was even less "evil" looking with bright pink and shiny metallic gold. If the toy line was to end early before completing the vintage roster, I would have gladly sacrificed Entrapta. All this former disdain is why I'm so bowled over at my infatuation over this toy. The Four Horsemen didn't even drastically change her design, but somehow they made this "dud" (IMO!) of a character amazing. Sure, her colors still look much more Rebellion than Horde, but something about the look on her face and the menacing look of her hair thrills me. The hair is amazingly well done. Who needs a crossbow when you have those locks? No one! Let's check out Entrapta below! Entrapta comes with two accessories: a typical POP shield in purple and the Shaping Staff. 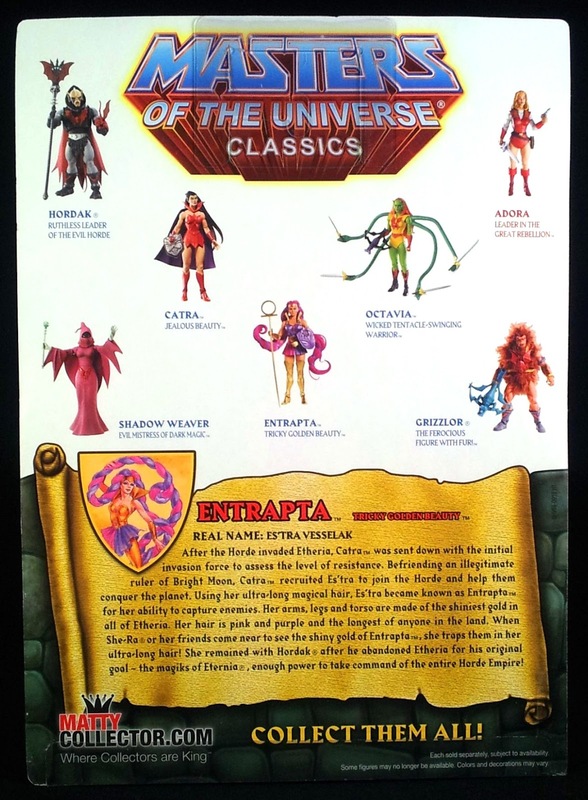 The Shaping Staff is a "bonus" accessory thrown in by Mattel. 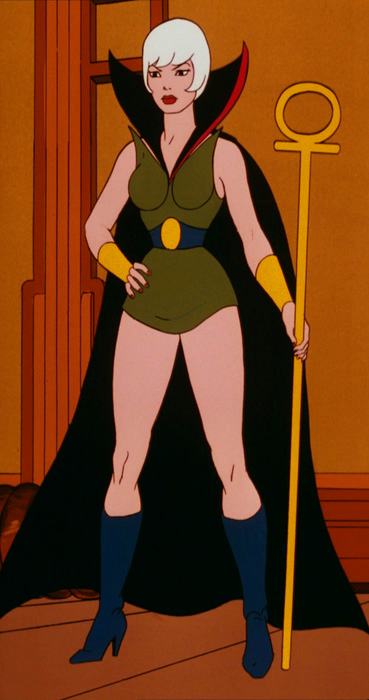 An entire amazing episode of He-Man (titled "The Shaping Staff") was centered around this staff and its powers. It wasn't a POP accessory at all, despite looking very at-home with Entrapta. The Shaping Staff episode used to give me nightmares as a kid because I had a irrational phobia of people being transmutated into immovable objects. Mostly this dealt with people slowly being turned into stone or ice.. starting at the feet and rising up (a common theme in kid's entertainment surprisingly). Anyway, when the Sorceress is turned into a tree by the staff it sent little 'ole me into a panic. Painful memories, Matty... thanks. Like I said above, I think the hair is just amazing. Each pigtail has a swivel and hinge joint at the scalp and a second swivel cut near the end. These four joints create a surprising amount of variation. The only flaw with this figure is that the weight of her hair can pull her head in different directions unintentionally. I half-heartedly want to say that her head is loose, but it's probably just the weight of the articulated hair overpowering the neck joint. Here are a couple images of Entrapta from the show. I thought she was painfully bland.